I almost didn’t make it out of the house. 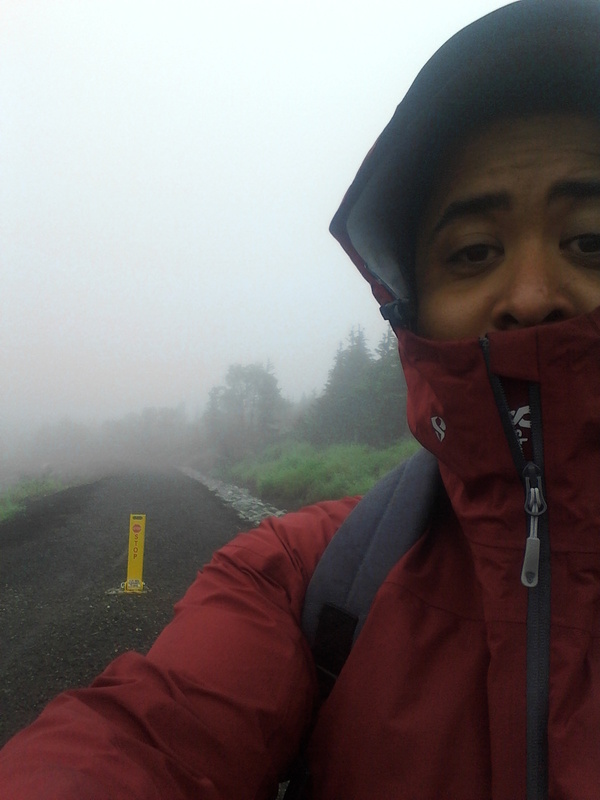 I had planned to go hiking Saturday morning but when I didn’t get out of the house early enough I decided against it. You see the parking at the Glen alps lot is limited. As you can see above they recently expanded it. If you park on the road outside of the lot its an exorbitant $200 ticket. A daily parking pass fee is only $5. Which isn’t all that bad of a deal. Actually if you want a pass for the whole calendar year its only $40. Which if you do the math, in just over a week the parking pass has earned its worth. Knowing that the parking is limited is important. Because you don’t want to drive up there and have no parking space for you. I learned today that the parking situation is so bad that they installed a webcam. Not knowing about the webcam when I got out of the house late on Saturday I decided to delay. Saturday the weather was beautiful and warm. Sunday I woke early to a drizzle. It was cool and wet. I was pretty certain that it wouldn’t be packed. 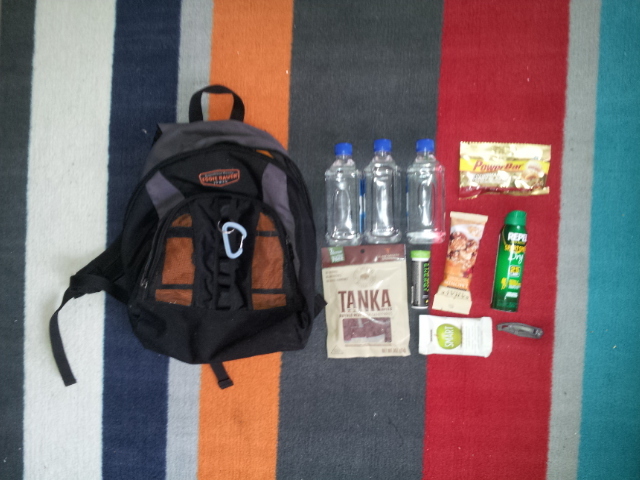 I filled my backpack with a bunch of goodies I had grabbed from REI before the holiday and got out the door to grab some breakfast and head up the mountain. Can you ever have enough snacks? Nah. Not pictured is my clothes. I put on tank top, short sleeve button up with a pocket, jeans, shoes, and a rain jacket. I had a pair of headphones in my pocket but I never used them. I don’t know about you but I can feel the change in pressure whenever I ascend. 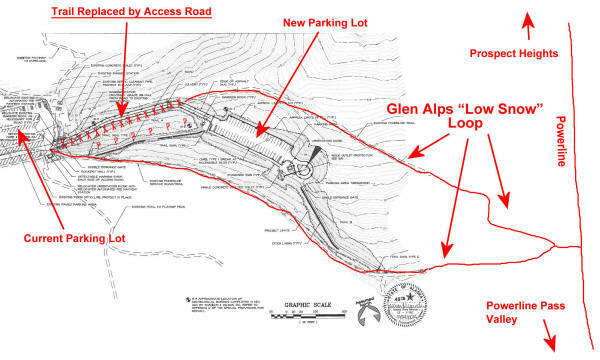 The Glen Alps Trailhead is about 2200′ elevation. Just before I reach that elevation I can feel it in my ears. The pressure along with the lowered visibility had me thinking maybe I’d made a mistake in heading out. It had the eerie scary-movie sensation. The lot was mostly vacant. There couldn’t have been more than 5 vehicles in the first lot. But I didn’t come all this way to turn back. Scary movie scene? Or Nah? Early along access trail to powerline I ran into a couple with a pair of huskies and a woman with a pair of golden retrievers. It seems they had met each other on a previous day. We would separate as they exchanged phone numbers. Although I brought headphones. I was never tempted to put them in. I had planned to cross the valley and attempt Omalley peak but the diminished visibility changed the plans. A big reason I wanted to do Omalley is the view of Anchorage. With that out I decided to make my way down powerline trail as far as I tolerate. As you can guess with a name like Powerline its pretty straight and wide for a trail. Not very strenuous if you stick to powerline. You could barely see the base of the mountain across the valley. Fortunately today there was no wind. Wind can be unrelenting between mountains. In the distance you could hear the water rushing. Nearby there were birds chirping. Much louder than you would hear in town. Lots of short bushes and wind trimmed trees. Short and colorful flowers were abound. You have to stay alert. There is so much to look out its easy to get lost in it all. Your eyes need to be staring out as far as possible and listening for any large or aggressive animals. 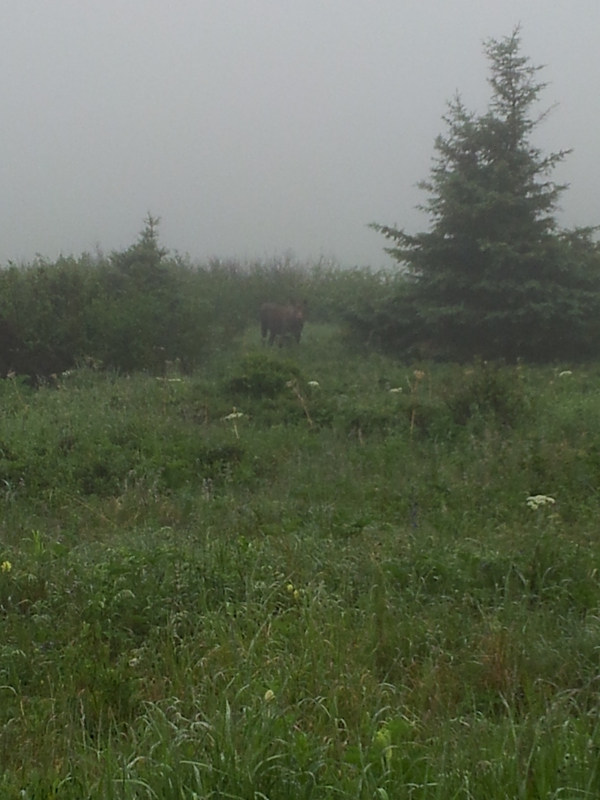 Sure enough, about 1 mile out there was a moose on the east side of the trail. The moose definitely heard me but was unbothered by my presence so I kept it moving. I enjoyed my time and began to wonder just how long I could go before turning back. This is when it got interesting. Just before I reached 3 miles I looked west up the mountain. [No pictures of this incident] What I made eye contact with less than 50 ft away was a brown bear.Yes a bear. Not a full grown. Probably a yearling which is even more frightening because the mom may be nearby. I stopped, backed away, and it obviously didn’t want any problems either. The bear ran east towards the trail but away from me. That was my sign that I didn’t need to go any deeper today. Not too far back I ran into the couple and the woman with the dogs. At this point trail etiquette dictates that I notify them of the bear sighting. Once I conveyed the news they concurred and we started the return hike back on Powerline trail. 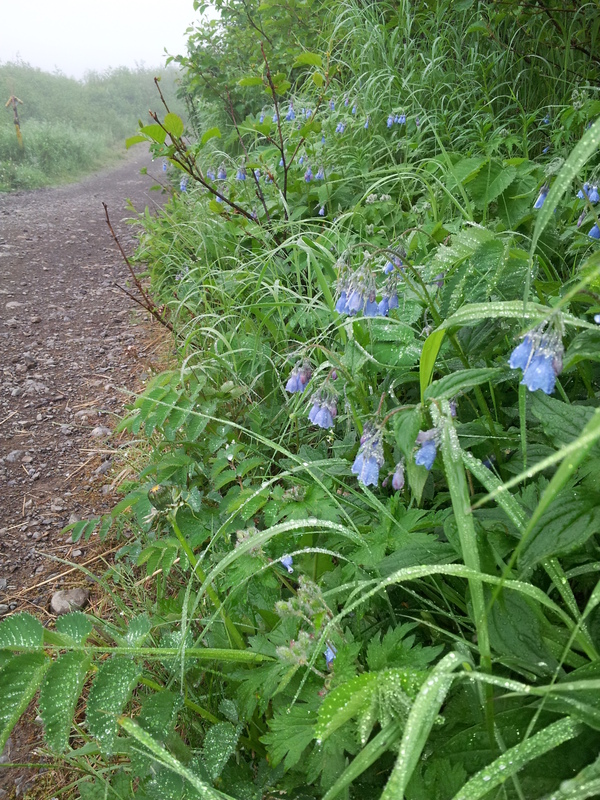 It was nice to have some company on the trail. All in all it was a great hike. The things that didn’t go as planned served to make it a more memorable trip. I’m more apt to go out and try it again and next time even further. Happy hiking folks.